There’s been a lot of talk in the last few weeks about the death of music. 2019 is barely five days old and already I’m reading how it will be the last year in which we expect to buy physical formats on a large scale as consumers. Of course, it’s early January, so there’s no doubt an endless amount of copy that has to be written and the statistics published commemorating the achievements of the last year always seem like a good place to start. According to the BPI, or British Phonographic Industry, 2018 has seen a decline of 23% in CD sales compared to the twelve months previous. Year on year this equates to a drop of 9.6 million but comparing figures from ten years ago, there’s been 100 million fewer CDs sold. That in itself is easily explained. Changing consumer habits, including streaming services, have meant that we’re now far more likely to purchase digital downloads or a subscription than a physical product. Less cars feature CD players, of course, and much like its predecessor the cassette it’s simply not cost effective to produce them on such scale. Shrinking shelf space in supermarkets doesn’t help, of course, but HMV’s recent woes would suggest we seem less interested in actually owning our own music. Last night I spoke with a friend and commented that, aged 17, it would have been abhorrent for me to think of being a fan of a band and not owning the majority of their albums at that time. Singles, EPs, Albums, live releases, you name it – I would have wanted it – and yet nowadays the proverbial snowflakes of the generation are probably uninterested in purchasing and acquiring such physical content. Almost 17 years later it seems that my way of expressing interest in a band is simply not the same and this change can easily be seen. According to the BPI, however, there is hope in some areas. Vinyl sales have grown just 1.6%; and although this is not an astronomical rise, it is a rise nonetheless – with 4.2 million records sold. That in itself is a rise upon previous years sales and means sales have yet to stagnate or even decline. Considering this format was originally abandoned due to its ‘impracticality’ I would still equate this to ‘new’ Vinyl being a successful format. A younger music fan I met recently in HMV was heard to remark to her friends that she wanted to own only Vinyl albums, with the artwork and design being the main reason for doing so. From a practical point of view, they also make excellent mementos, should you be lucky enough to get them signed or obtain a limited ‘colour’ edition upon release. Some record labels, such as Germany’s Nuclear Blast, will regularly release the same album in several variants from popular artists – and it’s not uncommon for hard-core fans to want to purchase every single one. I mean, somebody has to be buying them, right? It’s certainly true to say that we’re becoming more consumer conscious, watching everything from our weight to our spending habits, and choosing things a lot more carefully than the generation before. Even so called ‘luxury’ items or disposable income simply isn’t as clear cut as it once was. Ed Sheeran’s album ‘Divide’ definitely divided fans, with 59% purchasing the album digitally and yet 40% purchasing the album physically; making it one of the UK’s biggest selling albums of 2018. The biggest, perhaps unsurprisingly, is the soundtrack to ‘The Greatest Showman’. The film stars Hugh Jackman as PT Barnhum, an American showman, businessman and politician who perhaps equates more to Donald Trump and Vince McMahon today as he does to the actor who plays him. Sales of this film – whose soundtrack remained atop the UK Album Charts for 23 uninterrupted weeks – led to record breaking sales. Christmas week alone, it’s 22nd week, the soundtrack sold 57,000 copies alone with 48.7% Digital and 51.3% physical confirmed sales across 2018 in the UK. This soundtrack hasn’t left the Top 5 of UK Album Charts all year and is just one reason why Hugh Jackman is one of Hollywood’s hottest properties. The picture is the same in America, where CD sales have fallen 80% in the last decade, from roughly 450 million to 89 million. “Lots of us have changed the way we consume music and film, and more people are streaming from Netflix or Spotify,” Kim Bayley of the Entertainment Retailers Association recently told BBC Radio 5 Live. Jon Tolley there quoted from a BBC article, who runs the independent record shop Banquet Records in London, arguing that perhaps Vinyl is a way for consumers to rebel against a disposable society. A novel concept, if not somewhat expensive. Perhaps the most surprising statistic, however, is Vinyl’s effect on sales in 2018. Of course, we all know Vinyl has made an impact, but the artists who make the biggest sales – Nirvana, Queen, Fleetwood Mac, Pink Floyd, Oasis, David Bowie and Amy Whinehouse are either well past their critical peak or long since departed. These are artists who are appreciated for their sound, their legacy, and whom many fans (young and old) can collectively appreciate as not just a flash in the pan. Which would seem to support the idea of a “rebel rebel” philosophy. On the other hand, cynicism might lead one to suspect it’s because Vinyl is only released in such large quantities through albums that can be assuredly guaranteed sales, with Nirvana’s ‘Smells Like Teen Spirit’ at my local Tesco for a tenner and Michael Jackson’s ‘Bad’ not far behind it. Vinyl is, by a large margin, an expensive format – so selling classic albums for cheaper is bound to encourage those looking to build their collection for an affordable additional purchase. But Vinyl’s strength is not just limited to a private collector and his secret stash. I attended a Vinyl night in 2017 that has gone from strength to strength ever since in Newcastle, England. Hosted at the Tyneside Cinema, Drayton’s Record Player invites fans to enter a darkened room and listen to a Vinyl album uninterrupted (except briefly pausing to change sides, of course) – paying for the privilege. It’s an interesting concept, though not unheard of to physically pay money to do something you could do for free, simply to feel committed to take the time needed to achieve the act in the first place. Yet at this point I’m willing to admit Vinyl is nothing if not surprising, revisiting 2018’s highest selling albums in the UK on the format, with The Greatest Showman’s Cast Recording easily the youngest and second placed record on the list. Doubtful that I am Drayton would play it. Of course, streaming services have yet to eradicate the reflex nature, or whatever phenomenon it is that prevents Now That’s What I Call Music records from dominating sales across the country. Volumes 99, 100 and 101 make up a large part of the biggest albums sold in the UK in 2018 and other entries (like the Greatest Showman) are Cast Recordings from musicals and motion pictures that have dominated cinema attendance. Nostalgia serves a huge part in our consumer habits, as does affordability and ease of access, so there are many reasons to see why these albums prevent such an attractive purchase. Whatever people’s reasons for purchasing them, it’s unlikely that our obsession with Vinyl is likely to go away, especially as CD now ironically becomes the obsolete format. ‘Despite the well publicised state of the UK retail environment, HMV remains profitable, demonstrating the success of the turnaround programme instituted five years ago,’ said Paul McGowan, executive chairman of HMV owner Hilco Capital (September 2018). As Nipper may be silenced from barking permanently, I felt that it would be a good idea to write down some thoughts on the closure of HMV, considering that it so forcefully impacts the world in which I reside. You probably didn’t know that the name of the dog in the HMV logo was Nipper. If truth be told I only found this out when I actually worked for the company. But I want to make clear that I’m not writing this article as some insider or some higher authority, since I spent a few months working for HMV in Edinburgh and a few weeks over one Christmas working for HMV in Newcastle, and that pales in comparison to the hard working people I met during that time who’d spent years – if not decades – working for the company. In Newcastle, for example, I met a man named Keith. I always loved the phrase that he used when he said he wore the HMV shirt to work like a footballer strolled onto the pitch in his kit. There was a certain sense of passion I always encountered in HMV that was sorely lacking from other establishments. I first started visiting HMV Newcastle regularly in 2012 and the genuine knowledge of the staff stood out from a typical high street chain. I mean, granted, I’m not sure I’d ever strike up a conversation with someone about my Whopper in Burger King but I do think that stores like Game have never really employed staff with the kind of passion for their market I’d of expected. In 2013 I watched on as, having already worked for HMV in Edinburgh during 2008, it looked as if HMV was closing down. Several stores paid staff redundancy, they cashed out their pensions and walked away, yet after two weeks they were getting phone calls asking them to come back. It’s funny now because I suppose in that situation you’d have to see anything as temporary. But as the years began to pass once more you couldn’t help but get comfortable. Yes, it was a new contract, but this was the job you’d held all those years previous. And lightning couldn’t strike twice, could it? Vinyl is a great passion of mine, but there’s no doubting it’s expensive, with the average record costing anywhere from 20 to 30 pounds. Tesco sell Vinyl, and so do Sainsbury’s, but the selection in HMV is unrivaled. And unlike cassette – or even CD – it’s relatively difficult to just walk out the door with Vinyl records under your coat. I’m not saying they’re theft proof, I’m sure some have tried, but it would be a lot more challenging than your average Blu Ray. When HMV announced the administrators in 2013 several thousand flocked to stores in the space of days, purchasing goods that were discounted up to 80%, sales which ironically held a part in saving the company. But this time you have to imagine that HMV simply doesn’t own their stock, that so much of it is held on credit, agreements made that ensure closing the store would result in that stock being handed back to its legal owners. I remember when HMV sold iPhone in 2009 and people were quick to blame expansion like this as the reason for its downfall. The “rebranding” in 2013 promised that they’d be reevaluating their position in the market. I know that in 2015 they were reporting financial profits and their Vinyl sales had an exceptional profit margin. You didn’t have to be a staff member to know this, an article dated from September 2018 explains that HMV had outsold Britain’s four biggest supermarkets combined, and was experiencing a 27% surge in sales. The same article also quotes HMV’s profits before tax at 8 million in 2017 compared to 10.7 in 2016. Reading this article you wouldn’t imagine it was only a few weeks ago. So what happens in just a few weeks that threaten the jobs of 2,200+ people and countless other distributors and marketing chains? If we do live in a world where Amazon is being told by the consumer that, while it has its place, they prefer the physical touch – why has HMV struggled to get through another Christmas? The largest part of my belief is that credit can only be extended for so long, and that although certain elements have performed well, the sales of DVD and Blu Ray have massively fallen. When I visited my local store last night I considered purchasing Rick and Morty Season 3 (Pickle Rick!) but sadly reminded myself that I would be spending 20 pound for something already available as part of my Netflix package. There’s even an argument to be had that downloading illegal files is more time consuming then just powering up Netflix, Prime, Hulu or whatever you fancy and scrolling for something to watch. On the same token, Spotify can be told what to play by Alexa, so why do we need to purchase a CD with limited capacity for playback or – god forbid – fill an MP3 player. Why spend money on an iTunes account when their streaming services will simply play you an unlimited amount of music, whatever your mood or your feelings, and you can toss away that music just as soon as you’ve found it. I could write another article on that alone. But the point is that it does impact the way we spend our money. A friend of mine has a car that he uses his CD player in, and if it wasn’t for this device and the fact he too used to work in a retail store, he tells me confidentially he’d never buy another album that wasn’t on Vinyl. When it comes to the rows of Funko Pop vinyl and T Shirts, HMV is leading the charge, but the reality of what people will buy is far different. Regardless, I’m hoping my colleagues are able to begin this year with a sprinkle of hope and that even if the worst doesn’t happens they find themselves back on their feet as soon as possible. I loved House of Cards. It was a powerful show, built from the memory of a BBC serial, it outgrew its predecessor rapidly as it focused on the political machinations of Chief Whip Frank Underwood and his wife Claire. Drawing comparison with Macbeth, Underwood is the classic politician loyal to the King, yet spurned by that King and driven by ambition he aspires to become the King himself. Setting the show in Washington DC, in the heartland of US politics led to all kinds of possibilities, as the series itself began to be mirrored in the real life political ambitions of one Donald J Trump. And yet, as good as the show was, it’s main drawing power was actor Kevin Spacey. As Underwood, Spacey gave another phenomenal performance, proving that he is an extremely gifted actor with the skill for deception and the art of imitating life. On Christmas Eve 2018, it was announced by the prosecutor that Spacey would be charged with a felony over his sexual assault allegations, a matter which had first arose in October 2017 when Spacey admitted his homosexuality publicly on Twitter and spoke about allegations made from fellow actor Anthony Rapp. This snowball effect created a public outcry against Spacey who made no further comments and retreated into a self imposed exile while a number of Spacey’s current projects where either delayed or entirely altered altogether. We’re used to seeing celebrities fall from grace, normally such allegations coming long after their prime has passed, those like Jimmy Saville posthumously or Gary Glitter. Rumors or allegations may surface but it is only once the individual is well past their prime. Not so with Spacey. Although arguably some of his best work behind him, Kevin Spacey was still producing thought provoking and engaging drama, very present in public life and not likely to be retiring anytime soon. I had personally heard allegations from a family friend, who claimed Spacey had been auditioning for a play in Dublin in the late 90s, and had invited one of the younger cast members back to his room to discuss the role in private. It was always something that had stuck with me – even though I’d been told the story many years previously – but something I had assumed was such commonplace in certain Hollywood circles it was thought impossible to police. When the felony charge was confirmed on Christmas Eve, it seemed like old news, considering there had been no new comment from Spacey for well over a year. In the interim the studio responsible for his House of Cards show had announced it would continue for a sixth season. It was explained that Underwood had been killed off screen, with his wife Claire now resolved to take her place in the Oval Office. The show lacked something for me, and although there were moments of sparkle, I regret to say that they were moments built on the back of Frank’s involvement. The show was legitimately the Kevin Spacey hour and without his presence it felt like Netflix had commissioned the series simply to make a point that didn’t hold much water. Without the show’s lead actor it had nowhere to move. A deeply unsatisfying end to the series came and went and we were promised a resolution but received none. 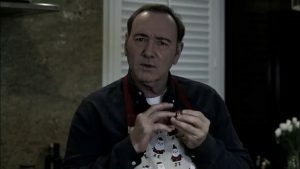 Suddenly, both Spacey’s fiction and reality were merged together, as he presented a short video from his official YouTube page. Entitled ‘Let Me Be Frank’ it showed a character, performed by Spacey, in the accent of Frank Underwood addressing the audience and asking what actually happened. The video has acquired several million hits in just a few days and that counter is far from slowing down, as many people have spent Christmas literally recording, editing and publishing their own reaction videos, analysis and feature commentary to this piece. 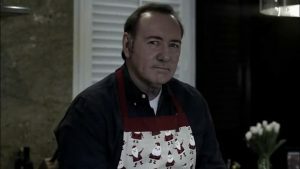 At the beginning of the video Spacey is seen washing his hands preparing a Christmas dinner. Dressed in a novelty apron, it would suggest that the video has either been created recently (owing to the fact it is Christmas Eve) or planned somewhat in advance. I personally believe the former, since Underwood’s character in House of Cards had grey hair and although Spacey may wish to give the impression Underwood is now living a secret life with colored hair, the lack of any grey hair is more significant I feel as a way of merging fiction and reality. Given the emphasis on Christmas, the washing of the hands is also slightly significant, considering that Jesus Christ (born on Christmas Day) was executed on the testimony of what is described as an angry mob. When attempting to deal with Jesus, and adjudicating his trial, Pontius Pilate is known to have washed his hands in gesture of relieving himself of the responsibility of this matter. My belief is that Spacey, who could have begun the video anywhere, chose to begin it at this point as he is washing his hands of previous issues and what is before him. Spacey turns to the camera having wiped his hands, and affixes a stare, though his words are spoken with the distinctive Southern accent of Frank Underwood. He starts by berating his audience, telling them they trusted him when they shouldn’t, and how he shocked us by revealing his deepest, darkest secrets. It’s an interesting juxtaposition between life and art, immediately Spacey is creating a sense of confusion between Frank Underwood and his own personal abilities as an actor and what rumors might have been heard in his private life. He takes a cup to drink, and does this twice in the video, which I believe in itself is significant. The cup definitely appears to be a regal – a royal design – and has a message in Italics on it. Of course, when Spacey continues and says “you and I are not done, despite what they say” it’s a chilling statement. His defense counsel will likely argue this is Spacey in character, though prosecutors may see this as an attempt for Spacey to influence any trial, stating that he knows what the audience wants, that they were quick to judge him without evidence and that they haven’t heard the real story yet. Even the video’s title, “let me be frank” is both a play on Frank Underwood and a potential way for Spacey to address his accusers. It’s also a way for Spacey to influence any potential jurors or judge before the trial is even set. If such a thing was released during jury selection there would no doubt be uproar. Spacey has chosen an ideal time, when the Holiday’s prevent anyone from doing much of anything until the New Year. This in itself is seen as a direct statement to anyone watching. Spacey goes on to say that if he (Frank, who knows at this point?) got away with the stuff he did do he sure as hell won’t be punished or what he didn’t. There’s a moment of pause after this statement, and you can’t deny the powerful nature of any monologue, which immediately makes you think about what is being said. Is Spacey blackmailing his accused, are we looking at the threat of further repercussions if they dare to challenge him. What does he know? Or is this just Frank talking. We are, after all, a world so heavily influenced by dialogue of fictional characters, people we’ve never met and reality television. At the end of the segment Spacey points out that you never actually saw him die, and then puts on a ring, a ring which looks suspiciously like (but which I doubt is) the ring from House of Cards Season 6 that Frank Underwood was meant to have been buried wearing. Frank wore the ring for the entire show but it was most prominently featured in the final season in his absence. The ring itself was about as close as we got to having Underwood as a character in Season 6 and showed just how much presence an actor can have in legacy when they’re not even present on the camera. Think about what Spacey is doing. He’s cooking a meal. He’s got his hunger back. He begins by washing his hands of the past, and he ends the video by assuming character, placing the ring off his finger and walking off screen. Those familiar with the very first season of House of Cards remember the pilot episode; Underwood eating ribs at Freddy’s the morning after Walker’s inauguration, and marking a page in the print with sauce to indicate the hunt had begun. I believe Spacey, a clever man with a tactile mind, has just given us a very clear motive of what he intends to do. Many reporters comment that the video has backfired. I don’t believe it has at all. Just like I don’t believe he’s made a bad move here. As of last count there were 42,939 thumbs down on YouTube from 6.375 Million Views; and 138,461 thumbs up. Regardless of guilt or innocence, I believe the true winner here is entertainment and fiction. A message seeking comment was left with Mr Spacey’s spokeswoman Laura Johnson. As Spacey walks off screen, we remember that he is an incredibly gifted actor, and what we’ve seen is a performance we’re likely to see again. Though on whose stage? The other day I found myself in HMV while my parents visited in the run up to Christmas. As it was a festive occasion, my parents had suggested we purchase a gift, something they could enjoy wrapping and leaving under the tree for me before their return to France. Not being one to ever miss out on a present I gladly accepted and proceeded to rummage through a number of my mental ‘wish lists’ attempting to come up with something I’d like to physically obtain. As I proceeded to leaf through the copious amount of Vinyl on offer I realised just how far HMV have evolved. December 2012 seems like a distant memory, but more tenured employees of HMV will remember the time well, as it spelt a certain end to the company. At the time, economists took great pride in appearing on news programs, telling us just how obsolete a store like HMV was in today’s marketplace. And yet, it remains. The store I was standing in, in Gateshead’s Metro Centre, had recently located to a more premier retail location and a new store, in Boston Lancashire, opens its doors in the very unit its predecessor was forced to close in March 2013. In many respects, it’s hardly surprising that HMV has managed to remain, but commendable and worthy of praise all the same. It’s current business model meant that more high priced items like phones, electronics and games took a back seat; while shelves were recently filled with comics, collectables and even Vinyl. Having worked for the company briefly in 2009 and again in 2013, I defiantly experienced some of this change first hand. Vinyl itself presented something quite unique; as if we’d suddenly travelled back in time and embraced a format which should – by all rights – be extinct. Just as many analysts argue HMV should be. Compact Disc has been a regular fixture in the marketplace since the late 80s, swiftly seeing off competition from Mini Disc, VHS and even Laserdisc; they even buried Vinyl considerably in an episode of Tomorrow’s World recorded around 1992. Whereas a lot of music fans have embraced the digital revolution a decade ago, retailers are limited in their selections, admitting that embracing MP3’s and Spotify subscriptions would leave them out of a job. So CD has found a bizarre and unchallenged equilibrium; until the return of Vinyl. Asides from their popularity with collectors, their physical appeal, their openness to customisation (who doesn’t love a good picture disc?) 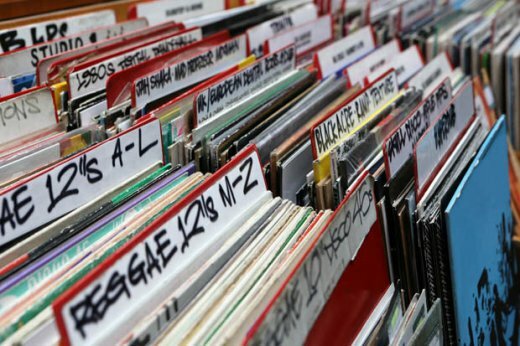 there’s also an exceptionally unique quality to Vinyl which makes it a more attractive proposition for retailers; it’s practically impossible to steal. Consider for a moment walking into a store on a cold Christmas day and shoving a cassette tape into your pocket. Even a CD would fit snuggly into an inside pocket without much effort. Vinyl, on the other hand, presents twelve inches of self-resistance to petty theft; for both customers and staff alike, making it the perfect product. In 2017 HMV predicted its most successful year of Vinyl sales in almost 20, thanks in part to the efforts of mainstream artists like Ed Sheeran and Noel Gallagher embracing the format, with UK sales for that year topping four million. In 2018 this trend continues, with the average purchase of Vinyl made by a consumer younger than those purchasing CDs, according to information from the website Kantar. 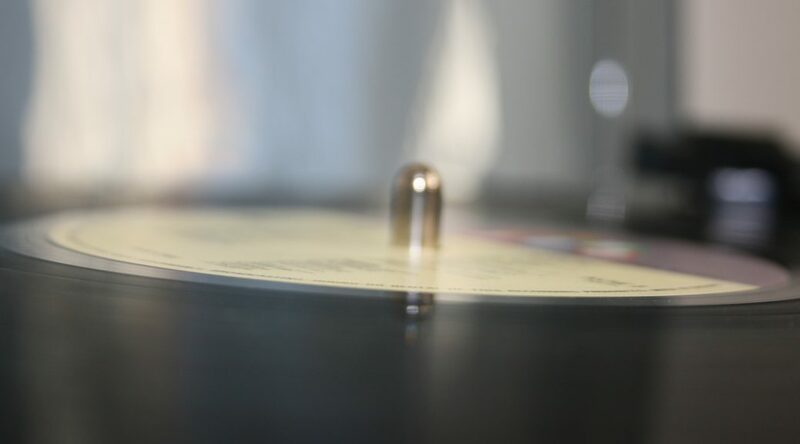 According to their estimates, the overall value of the vinyl market in the UK for the latest quarter (in the 12 weeks to 1 July) was £25 million. 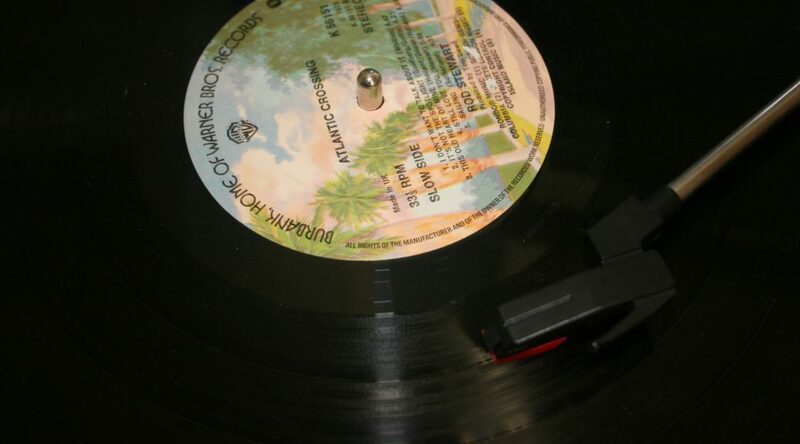 420,000 people bought a vinyl record in this period, up by 6.6% vs. Q1 (that is, the 12 weeks to 1 April). And this is despite the evident proof that not all collectors of Vinyl have the means to play them. What might be even more remarkable is that this trend has led to a number of other ‘Grave Formats’ returning to the fold. Swedish band Ghost released their latest album ‘Prequelle’ as well as their live compilation ‘Ceremony and Devotion’ on Vinyl, but perhaps more surprising is their choice to release it on 8 Track Cassette. Although a limited release, initially available through the bands website and the result of Spotify giveaways, their operations are not unique to just cult bands – with Metallica remastering their classic ‘And Justice for All’ album and releasing a special cassette version; which is available to purchase through Amazon and was also stocked in HMV alongside a Nirvana cassette release earlier this year. The introduction of the cassette tape by Philips in 1963 would lead to it becoming one of the most influential ways people consume music for over 30 years, and yet, it was somewhat ironically never intended never to rival the audio quality of the existing larger tape formats. Once Sony released a portable cassette player called the Walkman in 1979, such anti-taping arguments were more or less dismissed by the general public. Complete with portable headphones, the Walkman encouraged a generation of music fans to take their sounds with them wherever they went, and the advent of the boom box, which featured dual cassette decks, provided portability and seemingly encouraged music duplication through its design. By 1983 it was cassettes which outsold Vinyl. And yet, as I made my selection that evening in HMV, my father looked on slightly baffled as to why – at 63 – it was his 33-year-old son who was purchasing albums on Vinyl, Cassette and 8 Track in 2018. Everything it would seem, has its place.